1/22/2015. 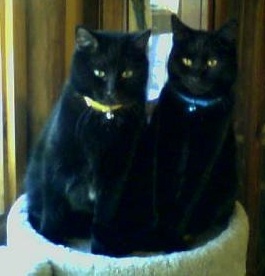 Duncan & Midnight are brothers who have been in our foster care and waiting for their forever home for a long time. Both are very sweet, affectionate cats and although they're now approx. 10 years old you would never know since they are quite playful guys.One of their favorites is the lazer light, then anything that dangles that they can swat in the air. Both boys are neutered, up to date on vaccines, and have tested negative for FIV and FeLV. Please note :The Cat Shack rescue is all volunteer and the adopted cats are delivered to your home. Because we deliver the cats to you, we must restrict the adoptions of our highly adoptable cats to a 1 hour drive from the Allentown PA area. In certain situations, "special-needs" cats, ferals and older cats will be adopted to homes at a greater distance then a 1 hour drive from Allentown PA. The first step to adoption is to fill out an on -line application. Click here to send a HOUSE CAT Adoption Application for this cat. All cats are vaccinated, dewormed, tested and altered as part of the adoption contract. This basic care (and other vet work required to make our rescues healthy) is included in the $75 adoption donation! All adopters also get an adoption gift bag with some free samples of cat products and a 4lb bag of Science Diet cat food.